The doll I found for this piece was laying on a shelf, already broken. The slight happiness on her face and her shattered legs contrasted each other beautifully. There were all kinds of metaphors and symbolism running through my head. I had to have her. At first I was trying to use an old broken record player as the base. I wanted her to dance. Unfortunately the record player was going to need quite a bit of work and I was afraid I wouldn’t get her set up well enough on the platter. I started putting her together to hand from a sling to make sure that the weight of her was not anywhere close to her legs. They were broken to bits but held together by the stockings she had on. 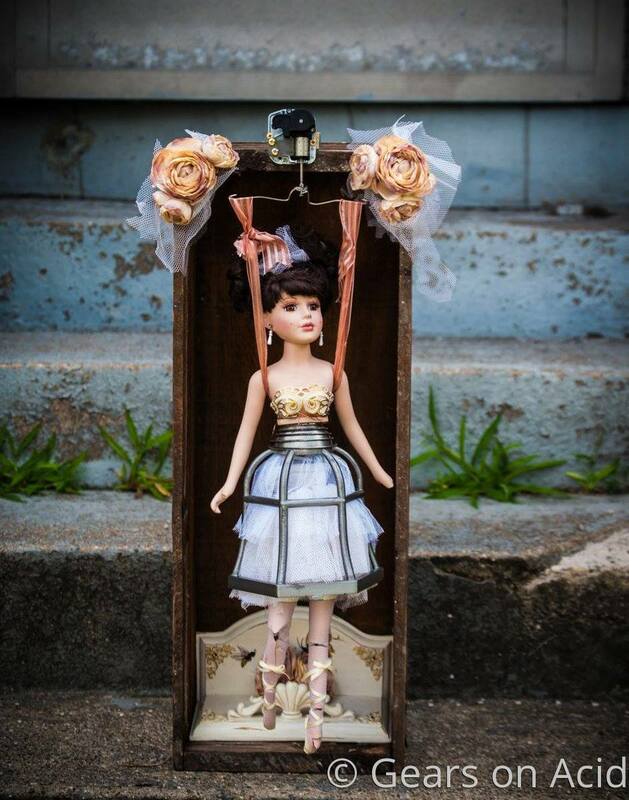 Eventually I found a box that she just fit into and hung her from a music box at the top. When the music box is wound up she dances with the music. She is the embodiment of perseverance with grace. She dances still, even when life has tried to destroy her. She does it without bitterness and with surprising acceptance.